The sound muffling fringes on a Snowy Owl feathers are less well developed than on other owls. They’re powerful fliers, and they use speed to secure their prey on with wing. Images of Snowy Owls have been recognizable in cave art [prehistoric]. They’re likely one of the oldest bird species. 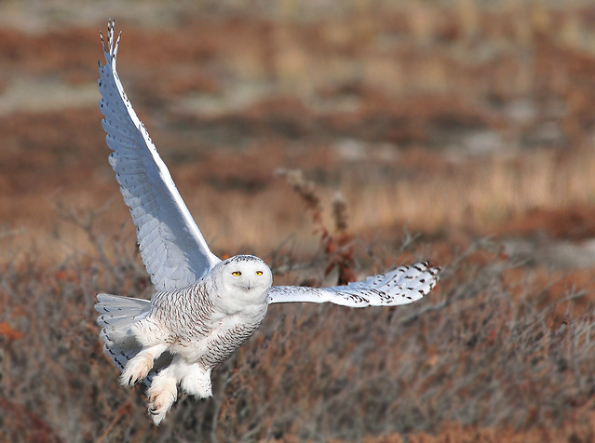 Snowy Owls have acute hearing and can locate rodents as they tunnel through the snow. Snowy Owls are diurnal in the Arctic during summer because daylight lasts 24 hours a day. When they move south for the winter, they become primarily nocturnal hunters like most owls. The female Snowy Owl is on average 1/3 larger than the male.